MY MILK TOOF: Happy Halloween! Cuteee Happy Halloween guys! Have a safe one! Awww, so darling! Hope they score lots of candy. :D Happy Halloween! super kawaii!! happy halloween and don't eat too much candy (i'm looking at you lardee)!! milk toof! why r u so adorable!! They really are so cute. This year's halloween specially. Happy Halloween! They are so adorable! Happy halloween! !They are so cute! Happy haloween guyss!! Sooo cute, love it! Happy halloween, ur lil monsters! 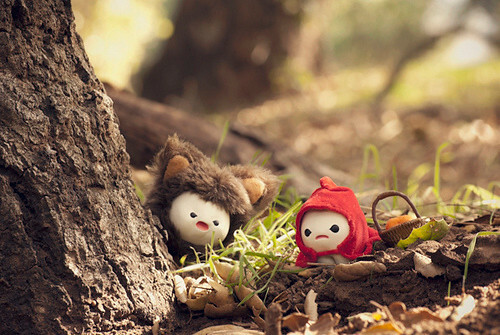 Lardee is absolutely adorable as the big bad wolf - and ickle makes a cute little red riding hood. I bet you had a lot of fun making their costumes! Very cute. Happy Halloween to Ickle and Lardee. I hope this becomes a photo story. ooooh, they're so cute *-* I just remember the halloween party last year. Watch out for candy, kids! So cute, Happy Halloween right back to them, I love those two! My brain just exploded with happiness at the sight of those fuzzy ears. ahhh love the wolf!! happy halloween! Happy Halloween Ickles and Lardy! Love ya! Wait... I always thought Lardee & Ickle were both boys... but Ickle is dressed up as Red. Does that mean Ickle is a girl? It's fine either way of course... my mind is just BLOWN since I always thought "boys" in my head while reading along. Horrifically happy Halloween to you all! I found them yesterday and I'm in love with them. They're so cute and expressives! Very good! I just saw this before going to work on a bleh Monday...now it is a Happy Monday! I am Brazilian and have found your blog a few days. I'm completely in love with the little milk Toof. In particular the Lardee. Your blog is filled with fun stuff. I like the toofs alot! i am brazilian and i loved your blog! the teeth are really cute! thank's and continue tje great job! Yoo, I'm a Brazilian too...I was reading all posts, and I must to say, congratulation. You are a very creative, the milk teeth are really cute *---*. Darn! No Halloween story this year? i think i saw them scamper across my patio! ickle and lardee i love you! i absolutely love Lardee's costume! it is adorable! your props are so intricate (they look quite hard to make), and they are so well suited to the teef! aww, there costumes are adorable! They are toooo lovely with their little costums ! first time - I heard about your Milk Toof !- wow, they're very, well -- CUTE. and Loveables. Keep doing more. Renee. I bet you had a lot of fun making their costumes.